The concept of growth hacking is quickly rising in importance and popularity as a business philosophy. The idea that everything about your business should be optimized toward rapid growth is not new but has become increasingly popular for smaller businesses as digital opportunities have increased their ability to embrace the philosophy. In web development, the general philosophy of growth hacking is reflected in the concept of growth-driven design. Rather than treating the development of a new or updated website as a large, one-time process, growth-driven design emphasizes rapid development and continuous improvement over time. We've covered the concept of growth-driven design and its benefits in a past post. But today we want to focus on a more specific topic: how a custom CMS can strengthen your growth-driven design project. Growth-driven design, in large part, depends on a continuous improvement model that requires frequent testing. Every aspect of your site could be better. From the navigation structure to individual headlines, every website has room for improvement. To determine improvement opportunities, the philosophy requires consistent testing of different iterations of the same page in order to monitor results. For example, you can determine whether a specific color or the location of a sign-up form may lead to better results if adjusted. 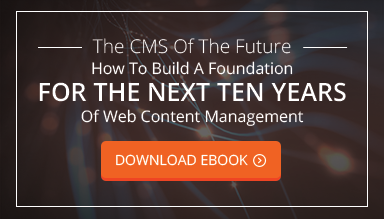 A Custom CMS helps you set up and manage these various iterations better than a template solution could. Through the backend, you can easily manipulate two versions of the same content, and migrate any changes to the entire page after the test is complete. Of course, A/B testing is not the only way you can and should test your website to improve its user experience. Frequent usability tests should also be a part of your plan, and they may uncover necessary updates to your content and user experience that expand to more than a single page. For example, your header image, contact information, or secondary colors may not work as well as intended in the eyes of your audience. Rather than having to change your individual pages one by one, you can set up a custom CMS to help you make these changes globally to your website. The result is an easier updating process that helps you keep your site successful and your UX positive. Over time, your tests will inevitably show the need for more thorough updates than simple color, text, or image changes. Your audience may begin to demand additional functionality, such as the ability to resize the text on individual pages or the ability to translate copy into multiple languages. As these major updates become necessary, your first impulse may be to engage in a full-on redesign and development of your website. However, with a custom CMS, you may not have to. You may simply be able to adjust and add to its backend new capabilities, helping you to add functionality without building a new website from the ground up. Ultimately, growth-driven design means continuously improving your website through both major and minor update to its content, user experience, and functionality. Rather than relying on one major development project to solve all your problems, you place your confidence and resources in a process that will lead to more reliable long-term success.